In the modern enterprise, it is rare to see a single monolith application that rules the entire landscape. While there still may be a large mainframe or another system which holds the principal data and source of truth (SoT) for an organisation, most landscapes today feature a medium to large set of applications that fulfill various business capabilities. These can range from a handful of apps to literally hundreds depending on the size and complexity of the enterprise. Whilst it is clear that the cost of integration increases along with the number of applications, one can also argue that the cost of change decreases as you move away from the “one app does it all” model. The reasoning behind this argument is that every single change, no matter how small, typically results in a full redeployment of the monolith application and necessarily incurs the cost of regression testing for the entire system. The concept of layers in an application architecture is not new; Gartner created the Pace Layered Application Strategy almost ten years ago to address the common disconnect between business leaders (who want their systems to be flexible and adapt to changes in the business landscape) and IT owners (who typically want to keep systems consistent as long as they are running smoothly). Identifying these varying rates of change and grouping the applications accordingly helps to apply an appropriate level of governance, change control, testing and DevOps – enabling the business to innovate where it needs to whilst protecting its critical data and core processes. Systems of Record (SOR) – These systems enable the core capabilities of an organisation, without which the business simply could not run. Because these are typically standard across the industry, these capabilities are not unique to a given brand or business (for example, every bank needs to manage accounts, transactions, customers, etc.). Consequently, these systems often are vendor supplied Commercial Off-the-Shelf (COTS) products. Because an organisation’s core capabilities don’t change very often, neither to these systems – change is incremental and at a slow pace. 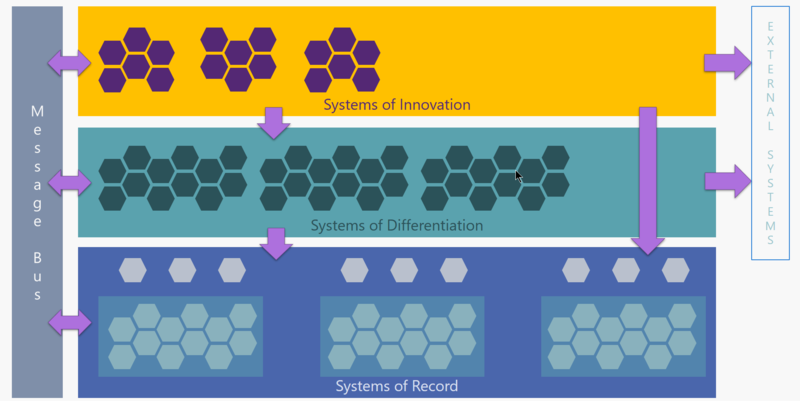 Systems of Differentiation – While core capabilities don’t vary much from one organisation to another in the same industry, business processes do. For example, your bank and my bank may both offer loans, but the way those two banks process the loans is likely to differ. Applications in this layer represent the processes that make an organisation unique, and typically are not accommodated out of the box by vendor provided Systems of Record platforms. Business processes may not change every day, but they do tend to change faster than core capabilities, for example streamlining processes and/or incorporating new technologies. Systems of Innovation – This layer moves the fastest of all. This is the “sandpit” where new ideas and technologies are tested. Experimentation here will likely include ad hoc proof-of-concept (PoC) applications which are rapidly developed and then manually deployed and tested. Let’s look at an example enterprise, for example a banking institution, and see how some of their applications might map to the pace-layered model. ABC Bank has several key systems including a core banking system, a loan management system, and a document repository. These systems are vendor supplied and installed. Change control is very strict and the data is heavily protected. Systems are subject to auditing by legislative bodies. The automated loan processing capability is managed by a custom-built integration solution which integrates with several externally SaaS services for real property valuations, title searches, credit scoring, and an online web forms provider. The solution was delivered through multiple phases of a large project. It is expected to have a medium lifetime (3-4 years). Fixes and change requests are managed via a BAU team. ABC Bank wishes to expose a chat-based interface for lodging loan applications powered by an intelligent bot. It is tested by a small sample group of customers. Adjustments and bug fixes are made quickly without a formal change control process until the solution is stabilised. After a few months of trial, a decision is made whether to progress the solution to a full-grown application or to scrap the initiative. Starting from the bottom layer, we see that each System of Record is typically a package which may contain several services/APIs. However, these APIs may not be directly consumable by the business due to misalignment with the logical data model, outdated protocols, or other reasons. In these cases, it is a good idea to introduce a “sub-layer” of APIs that bridge the SoRs with other APIs within the organisation. These abstraction APIs (called Product Adapters) are tightly coupled with the underlying SORs yet expose functionality in a much more palatable format. They may also introduce stricter access control, validation and security than the SORs themselves. The APIs generally represent the core data entities (Customer, Product, Order, etc. ), therefore they are granular and designed for reusability. Because they are so tightly linked with the core systems, they move at the same pace and therefore are considered part of the Systems of Record layer. Governance and change control will normally be very strict at this level because of the criticality of the data and the high dependency of services and processes that consume these APIs. In the Systems of Differentiation layer, we see applications that are composed of the granular services/APIs sourced from the System of Record layer as well as possibly external APIs. Here is where the business logic of the organisation lives, for example Loan Processing or User Provisioning. Functions that an application may perform in this layer include data aggregation, routing, filtering and often choreography/orchestration. Since they are specific to a process, they are less reusable than the underlying SOR APIs that they may consume. It is in this layer that the bulk of the integration within an organisation occurs. And because business processes can (and will) change over time, these applications will need to adapt as well, most certainly at a faster pace than the SOR applications. Governance should also be applied at this level, although perhaps not quite a rigidly as within the SOR layer; the organisation will want their business processes to be flexible enough to accommodate improvements in efficiency and expanding functionality. 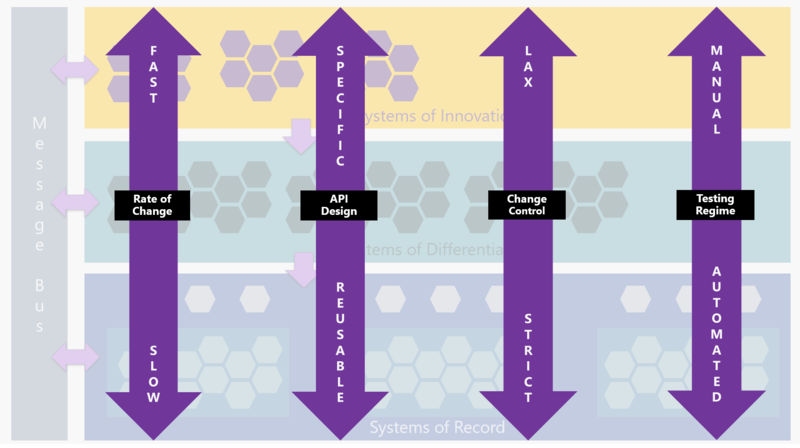 The Systems of Innovation layer also features applications that consume both the SOR APIs and external APIs, as well as possibly business processes in the Systems of Differentiation layer. As the fastest moving layer, it will have even lighter governance in order to facilitate the experimentation of new apps and technologies. The functionality enabled in this layer is often peripheral to the core capabilities of the business, and therefore presents less risk to the organisation in case of failure. Also apps that are created quickly to prove a concept will rarely feature automated testing or a mature CI/CD pipeline, as they would be manually deployed and tested. Finally, we use a Message Bus in order to facilitate both inter-layer and intra-layer communication. Asynchronous messaging patterns such as publish-subscribe keep systems loosely coupled and promote both extensibility and flexibility. The publisher doesn’t need to know anything about the subscriber, and you can always add or subtract subscribers without breaking existing integrations. A message bus is a critical element for lubricating the friction between applications that change at different paces. 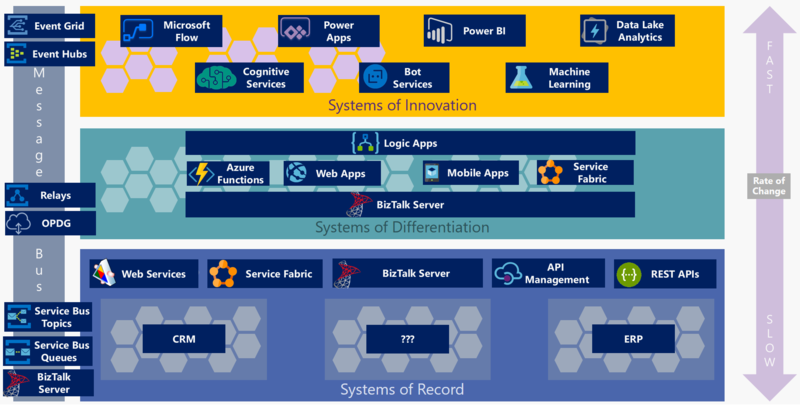 How Does Microsoft Help with Pace-Layered Integration? + More than 200 built-in connectors! Dynamics 365 / Teams / etc. Here are some tips on how to maintain adaptive integration within a pace-layered enterprise architecture. Consider how the applications you are integrating will be used. Is the integration mission critical? Then Logic Apps would be a better bet than Microsoft Flow. What are the security risks to consider? An API Management layer can provide policy-based governance, threat protections, and access control. How quickly might the solution change? This will influence how much investment is made in automated testing, CI/CD pipelines, etc. Make sure your System of Record layer is solid. 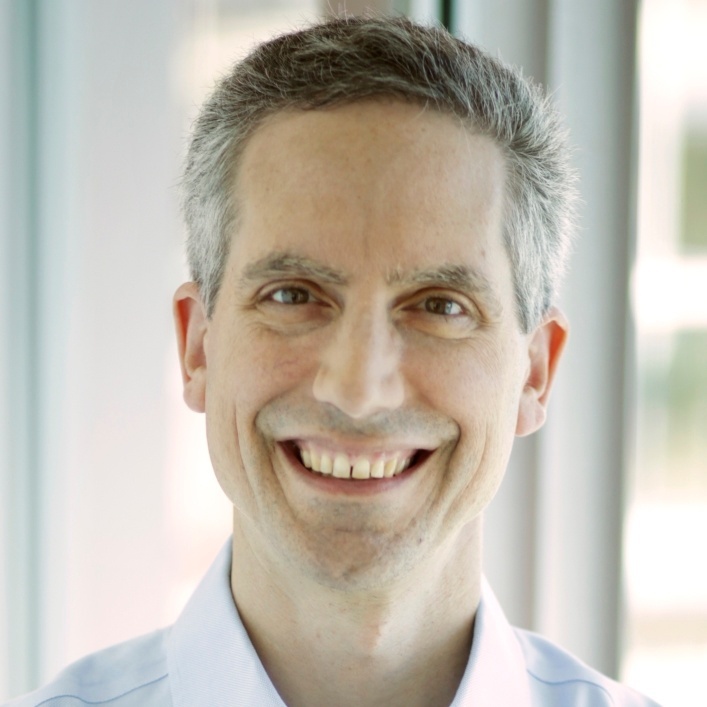 Are your APIs granular enough and well-defined? Remember that these will form the composable units for applications in the other layers. Is security and data validation strongly enforced? Don’t rely on consumers for this; protect your critical data close to the source! Limit customisation within each System of Record. If you customise the SOR, what will happen with the next vendor upgrade? Keep customisation with the System of Differentiation layer as much as possible, or at least in the API layer over each SOR. Consider using canonical data models to avoid tight-coupling with vendor systems. This typically requires a sound information architecture to define the business data entities. An information architect can build a logical model independent of software implementation; invest in this. Vertical dependencies are difficult to maintain – unless you are the owner of the whole stack. Choose a publish-subscribe messaging model wherever possible to maximise loose coupling and extensibility. Employ the right level of governance at each layer. Avoid crippling change control policies where experimentation is both necessary and safe. Empower business leaders to create their own solutions (e.g. using Microsoft Flow to automate mundane processes). Encourage experimentation! Use Microsoft iPaaS features to achieve “integration at the speed of business” (Jim Harrer, Microsoft).